350.org takes an uncompromising stand against oil, gas, and coal, the industry, and its leaders. The organization ties traditional progressive refrains about climate change and the need to transition to clean energy to more radical calls for extreme left-wing policy. 350.org frames the fight for renewable energy as one that pits the poor against the rich, the oppressed against the powerful, and the disadvantaged against the privileged. The organization sometimes weighs in on issues that appear unrelated to the environment, such as a Missouri grand jury’s decision not to indict a police officer after a police shooting in Ferguson, to show support for other liberal groups. 350.org was founded in 2008 by Middlebury College professor and journalist Bill McKibben. Its name comes from McKibben’s view that the world will not be safe from global warming unless the concentration of carbon dioxide in the atmosphere falls to 350 parts per million or below. Over its first decade, 350.org has organized protests around the world, many of which have resulted in civil disobedience and arrests; led campaigns to divest from fossil fuels; and pressured governments to adopt progressive policies against the cheapest forms of energy. 350.org claims credit for then-Senator Barack Obama’s global warming platform during his 2007-2008 Presidential campaign. A year later, 350.org supported the UK-based 10:10 climate change protests on October 10, 2010, which demanded a 10% reduction in carbon emissions that year. Angered at the Republican takeover of the House of Representatives in 2010, 350.org began 2011 with a 10,000-person “climate conference and training” in Washington, DC, called Power Shift 2011, where attendees were joined by controversial former Obama “green jobs czar” Van Jones and AFL-CIO labor union federation president Richard Trumka. McKibben used his speech to assail libertarian philanthropists Charles and David Koch, the U.S. Chamber of Commerce, and Obama administration Secretary of the Interior Ken Salazar. The next year, 350.org organized Climate Impacts Day, which aimed to “connect the dots” between global warming and extreme weather and give “a human face” to those affected by climate change. And in 2014, as the UN held that year’s climate summit in New York, 350.org responded by holding the first People’s Climate March through the city. The organization was successful in helping to orchestrate a seven-year “review” of the Keystone Pipeline that concluded with its rejection by then-president Barack Obama, an action ultimately reversed by the subsequent Trump Administration. McKibben in 2015 for blocking access to a gas pump, and in 2016 at a lake in Upstate New York in opposition to a proposed gas storage location. The organization has taken a strong stance against the Trump administration and its policies, issuing denunciations of President Donald Trump, his Cabinet, and the administration’s actions. “Trump is trying to hand over senior federal positions directly to fossil fuel industry puppets and climate deniers, and we won’t let him get away with it,” Executive Director May Boeve said in a January 5, 2017 press release. EPA Administrator Scott Pruitt, Secretary of State Rex Tillerson, and Energy Secretary Rick Perry are those most frequently singled out for criticism. 350.org’s website lists its allies, which include Amnesty International; the College Democrats of America; Greenpeace; Oxfam; Sierra Club; the Unitarian Universalist Ministry for the Earth; anti-vaccine advocate Robert F. Kennedy Jr.’s Waterkeeper Alliance; and the World Carfree Network, which opposes the use and sale of private motor vehicles. Some vegan environmental activists who are displeased that Bill McKibben and 350.org do not criticize meat consumption have attacked the organization on that issue. Allies of McKibben have responded by accusing vegan advocates of racism and of being insensitive to the needs of poor people for whom what to eat is not a choice. The organization employs a staff of more than 100 people, who are based in dozens of cities around the world. Its Board of Directors includes Bill McKibben and eight other longtime progressive activists, one of whom, Naomi Klein, is also well known for her anti-Israel views. 350.org has a 501(c)(4) sister organization, 350.org Action, which engages in political work and evaluates candidates for office. Many staffers work for both organizations. 350.org does not disclose its donors. However, it has admitted to receiving funding from The Tides Foundation, a San Francisco-based donor-advised fund that has funneled hundreds of millions of dollars to liberal groups from donors and foundations wishing to remain anonymous. 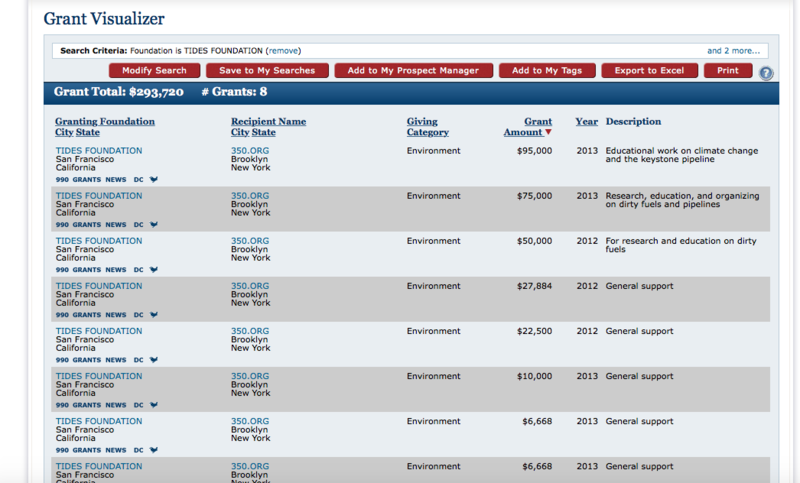 Groups linked to George Soros and Tom Steyer have also contributed extensively to 350.org.